This paper ostensibly began as a critical and objective examination of the history of a child-sized kubbestol in the Mount Horeb Historical Society’s collection. But almost as soon as I embarked on this project, I found it difficult to maintain the analytic distance that has been fundamental to my training as an art historian. The kubbestol is a traditional Norwegian chair carved from a section of hollowed log. This particular kubbestol, though unremarkable in form and decoration, stands out for its diminutive size. At just over a foot high, and with roughly half as wide, the chair’s evocative power is amplified by its shrunken stature, prompting allusions to family and the magical milieu of childhood. My first knowledge of the little kubbestol was textual, described simply as “log chair” in an emailed list of potential objects of research compiled by the Mount Horeb Historical Society. I imagined it to be a sort of rustic-looking cabin chair; the kind made from young trees or branches with their bark left intact. Though I did not find this description particularly compelling, I volunteered to research the log chair in lieu of any other listed object that fit my research interests in landscape relationships and representations. With fairly low expectations, I was surprised and delighted when the “log chair” was revealed to be a kubbestol. On a visit to Mount Horeb, the historical society’s exhibitions curator ushered us down a flight of stairs to the Society Museum basement where the furniture not on exhibit was stored. There was a literal unveiling, as the curator lifted the protective sheet that covered the furniture, and I saw this strange and precious chair nestled like a toddler between two protective, adult-sized kubbestol. There is something uniquely evocative about a piece of furniture that has been shrunken to childish proportions. The dimensions of this object provided a kind of narrative fodder that I have rarely encountered in an object I knew so little about. This little kubbestol appeared to invite a child’s interaction with the rest of the household. It conjured a picture of a tiny Norwegian-American tyke taking her or his dignified place around the fire with the rest of the family, as mother or father told thrilling tales of the trolls that menaced the landscape back in Norway. In my imaginative flight, the small child listens enraptured from the same kubbestol that serves as an impish throne to the story’s woodland-sprite holding court from the forest-floor. The prospect of unearthing this tale of Nordic-American childhood, through an object that looked as if it were lifted from a fairytale, was so engrossing that I later found it interrupting the clarity and direction of my research when I could not reconcile a discovery with my fantasy. I came away from that first visit to Mount Horeb with a copy of the curator’s work sheet for little kubbestol, providing its estimated age (1850-1870), the family name associated with it (Grimstad), and the name of the artist believed responsible for its painting (Per Lysne). As I researched this little kubbestol, I found it increasingly difficult to distinguish between the conclusions and investigative threads that could be properly sourced and cited, and those prompted by its uncanny evocative power over me. In her book, Evocative Objects, Sherry Turkle argues for the considered acknowledgement of “objects as companions to our emotional lives or as provocations to thought.” Arming myself with Turkle’s supportive text, I have supplemented the following biographic research of the little kubbestol with an autobiography of my own investigative process. My hope is that this unorthodox format accomplishes two things. First, that by being forthright in first person, I may mitigate some of the damage that might otherwise be caused by the bias of my imagination. Second, I hope that this narrative supports and illustrates my thesis, which posits that the historic significance and cultural resonance of the little kubbestol are not confined to a specific community or era, but are embedded in its physical form: accessible to anyone with the desire to reach for them. I determined to realize my ambition by pursuing two veins of research. First I endeavored to flesh out the familial narrative surrounding the kubbestol by mining the resources and archives available through the Mount Horeb and Wisconsin Historical Societies. Second, I conducted broader research on Norwegian culture and customs, focusing most closely on decorative arts, folk-craft, mythology, and folklore. By following these two investigative paths, I was able to tether the symbolic and cultural significance of the object to a real family and place. Through tracing the physical biography of the little kubbestol, the life of this object parallels the evolution of ethnic heritage. It began as a material manifestation chosen by Norwegian immigrants to reflect a portion of their ethnic identity they wished to keep of the life they left behind. Later, the little kubbestol became an actor playing itself in a theatrical version of Norwegian-ness. Finally, for the moment at least, the little kubbestol resides at the Mount Horeb Historical Society, respectfully cloistered as remnant of regional heritage. The distance between the little kubbestol’s cultural role and original function increased with time in each phase of the objects life. But I posit that this distance does not represent the relinquishment of ethnic identity or disregard for ethnic traditions, but rather signifies an utterly authentic transition from Norwegian to Norwegian American. I began my investigative journey with the object itself. And because, before my fateful encounter with little kubbestol, I had never seen or heard of a kubbestol before, some grounding context is needed to facilitate a closer reading of the little kubbestol. In addition to a full physical description of my particular object of study, I will provide a brief history of the art form, and its cultural functions. The kubbestol is a traditional Norwegian chair formed from a single section of log, or ‘kubbe’ that is first hollowed out and carved to shape the chairs back while still green. Then, after allowing the kubbe to cure for several months, a piece of wood is cut and fitted into the hollow where the chair back begins to form the seat. The full circumference of the log is almost always left intact, with a trunk-like base rather than legs as the support for the chair seat. Traditionally, kubbestol made in Norway were primarily made from birch, which is abundantly available in the forested regions where the craft was popular. The little kubbestol at Mount Horeb is a mere seventeen inches high, with an eleven-inch diameter and formed from rough-hewn pine. By looking closely you can see that exterior is subtly faceted by the organic rhythm of the hatchet that shaped the soft wood. 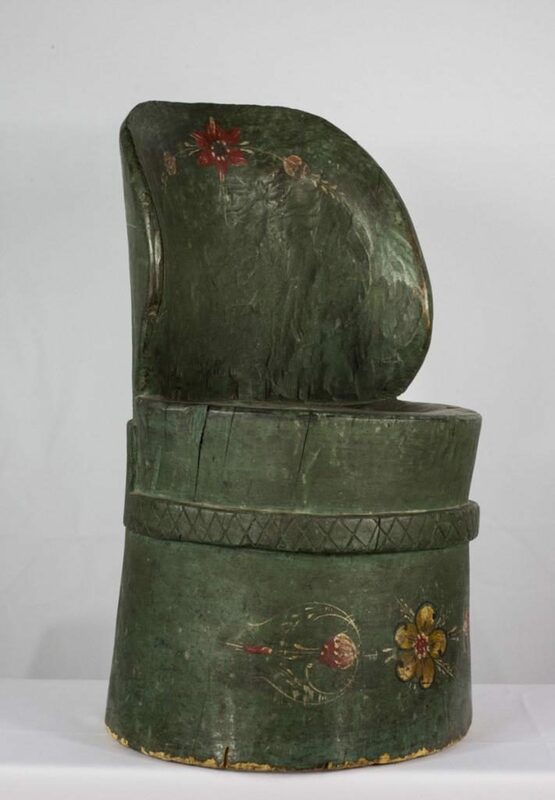 The kubbestol is stained a rich, forest green that maintains its rustic respectability in the face of fading and discoloration, while the base and back of the chair are decorated with a simple rosemaled pattern of primarily red and pink flowers, with a yellow flower in the center of the base decoration. Although there is a long history of kubbestol carving in Norway, the specific origins of the chair’s design and purpose remain obscured. Kubbestol were most popular in eighteenth- and nineteenth-century Norwegian peasant homes. However, there are extant examples that were elaborately carved for more conspicuous settings such as churches, and others from as early as the twelfth century. The peculiar form and custom of making kubbestol is one of many folk traditions that migrated to Wisconsin along with the thousands of Norwegian immigrants who made their way to the primarily south-eastern part of this state in the Nineteenth Century. In her definitive work on Norwegian Folk Art, Marion Nelson details how, for Norwegian-American immigrants, these creative traditions supplied a mode for materializing the community, culture, and values left behind. One of the most intriguing aspects of the kubbestol is its remarkably close relationship to the raw material it is made from. The kubbestol represents perhaps the least drastic example of a transformation from tree to furniture. Rooted by its wooden circumference, flush to the ground, the stools emerge from a floor almost exactly like the tree-stumps they were hewn from. The former life of the material is further emphasized by the kubbestol’s cross-section seat, which reveals the rings and grain of the tree it was cut from. The kubbestol’s form, and the process required for its realization, contrasts with many other examples of this class of object. As a utilitarian object that most frequently populated the rustic peasant cottages of Norway, the kubbestol is far too time-consuming a production, and too bulky a product, to represent a merely practical seating solution. On the other hand, the kubbestol’s adamant tree-ness, its defiant resemblance to the raw material, contrasts noticeably with the decorative endeavors of many other folk furnishings, for which a high degree of transformation is desirable. The little kubbestol is crudely formed. But I use “crude” here, not as a value judgment, but as a description of the very minimal aesthetic intervention that takes place between raw material and the finished product. The tree-ness of the kubbestol clearly played a large part in the material culture fantasy that prompted this investigation, and having since learned more of Norwegian folk art, I can assume that a community so invested in the symbolic functions of their domestic objects did not happen upon this distinctive seating design by accident. In this section I will explore the cultural history of how Norwegians and Norwegian-Americans have represented and interacted with nature. Looking at geography, fairytales, folklore, and material culture, I will attempt to elucidate the unique ways in which nature is embodied for this ethnic community. Every culture and community is shaped in some ways by their relationship to the landscape. The cultures and communities of Norway have produced a particularly visible and distinctive relationship to nature, which I can only briefly explore here as a contextual background to the kubbestol’s symbolic significance. Norway’s peculiar geography, climate, and vegetation, render the landscape both diverse and distinctive. The climate and altitude range in the Telemark region of Norway—from which the Grimstad family and much of the Norwegian population in Southern-Wisconsin emigrated—encompasses an astounding five different vegetation zones. These zones range from the coniferous and deciduous woodlands of the boreo-nemoral zone, to the dwarf birch and scrub willows of the southern arctic zone, with three more varying woodland regions packed between them in an area less than a tenth the size of Wisconsin. Suffice it to say that Norwegians in general, and Telemark Norwegians in particular, encounter and interact with trees and forests in a more substantive way than much of the rest of the world. The prominence of forestry to Norwegian landscape and life may explain at least part of the kubbestol’s remarkably close relationship to the raw material it is made from. Resting on a wooden circumference, flush to the ground, the stools emerge from a floor almost exactly like the tree-stumps they were hewn from. The former life of the material is further emphasized by the kubbestol’s cross-section seat, which reveals the rings and grain of the tree it was cut from. As remarkably raw as the kubbestol was to my unfamiliar eyes, when placed in a broader picture of Norwegian folk and decorative arts, the stool appears less startling. Though the kubbestol is still unique in the way that it appears to have sprouted from the floor it rests on, much of traditional Norwegian interiors convey a similar impression of having grown out of some sort of uncanny forest. The standard for mastery of wood carving in the Norwegian folk-tradition is exemplified in furniture displaying intricately patterned carved surfaces. A majority of these examples, with their organic, symmetric designs carved in high relief, more closely resemble the magically reordered bark of a tree than they do any aesthetic human endeavors. Although I have previously stressed the importance and prominence of the forest to Norwegian geographic and economic identity, they are certainly not the only ethnic community to be shaped by their environment. But Norwegian folk are perhaps unique for such a community, in how this relationship to nature manifests in the domestic sphere. Whereas domestic space and furnishings for most of the world illustrate a desire for increasingly distinct boundaries between the domestic interior and the wild exterior, the height of Norwegian domestic crafts appear to blur that distinction. The acceptance of an un-subdued version of nature into the Norwegian domestic sphere may be explained in part by the cultural influence of Norway’s folk and fairytales. In much of Scandinavia, but Iceland and Norway in particular, the landscape is animated by a rich and vivid folklore tradition. This is a country where landscape features might be named for the magical events taking place in their history, where a large boulder could be a troll turned to stone by sunlight, and where any mountain, river, or tree, is potentially the jealously guarded home of a magical creature. It is unsurprising that in such a setting—where the line between human and nature or flora and fauna is so indistinct—that boundaries of a human-controlled interior would be lacerated. In a culture where the work of natural elements were attributed to the mischief of wily, sentient beings of varying powers, it may even be unwise to advertise your bald humanity by creating a home that appears inhospitable to the natural world. The size of the little kubbestol is at enchanting odds with its fundamental physical character. Though there are many examples of kubbestols featuring intricate painted or carved decorations, their scrolled vines and flowers don’t disguise the assertively solid mass that defines the chairs’ form. The use origins of the furniture make the existence of Mt. Horeb’s diminutive kubbestol all the more piquiant. Was it made for a real child to use? If so, what was the familial context and history of its creation? Could it have been the product of a craftsman practicing with a smaller trunk before graduating to a full-sized kubbestol? Or was it, from the beginning, a novelty intended to evoke a sweet and folksy image of Norse culture for ethnic tourists? Armed with some knowledge of the history of the kubbestol as both a functional and symbolic form, I could now explore the biography of my object more specifically. I revisited Mount Horeb with the aim of piecing together the provenance of the chair and, I hoped, fleshing out the narrative of the family responsible for its existence. On the first return visit to Mount Horeb, I availed myself of the Historical Society’s library in search of clues that might provide evidence for the family drama I had already mentally constructed around the little kubbestol. The Mount Horeb Historical Society acquired the little kubbestol, along with another (adult-sized) kubbestol from Little Norway after the ethnic-themed folk-tourist site closed in 2012. Records from Little Norway show that a pair of chairs was purchased from one Aslak Grimstad on June 10th, 1929. The date of purchase and transfer from Aslak to Little Norway is the last concrete record of the kubbestol’s physical biography. [i] However, with some genealogical sleuthing, and educated conjecture, we can at least construct a plausible narrative frame for how and why the chair came into existence. Aslak Grimstad was the youngest child of two Norwegian immigrants, Knut and Mari Grimstad. The Grimstads arrived in the United States along with their six children in 1850 and settled in what is now the Wisconsin Perry Township where they had two more children, Carl in 1856 and Aslak 1858. We can assume that the kubbestol came into the Grimstads’ possession some time after 1850 because, as third class passengers on the boat from Europe to America, the list of personal items they traveled with would have been carefully considered and edited. The long, cramped journey across the Atlantic required travelers to pack only the most vital, valuable, or precious items, logically eliminating anything as superfluous and cumbersome as a child’s kubbestol. It is also reasonable to assume that a member of the Grimstad family made the little kubbestol. As a family relocating from the rural timber region of Telemark, Norway to the rural timber region of Wisconsin, it is far more likely that one of the Grimstads created the kubbestol as a way to replicate some part of their ethnic home than that they acquired it by any other means. Identifying the specific maker of the kubbestol within the Grimstad family has proven to be a more difficult task. Although it was Aslak who sold the items to Little Norway, his possession of the stool at that time doesn’t necessarily prove his particular connection to the furniture. Aslak’s brother Carl mentions in his memoir, written two years after the kubbestol sale in 1932, that of his parents and siblings, “Now only Aslak is left, he is on the old homestead yet….” Aslak’s residency on the “old homestead” suggests him as the default possessor of all the old family belongings. Knut, as the only adult male to have lived in Norway, presumably carried the practice and knowledge of the folk-craft from the old world. But it is as easily presumed that Knut passed this tradition down to his children, perhaps encouraging a young novice woodcarver to practice with the small tree that resulted in the tiny kubbestol. The memoir of Aslak’s brother Carl, Pioneers in Dakota Territory, 1879-1889 provides the most illuminating insight into the heritage values of the Grimstads. In the period recounted in this document, Carl left Wisconsin to stake a tree-claim in the Dakota Territory. The fact that he chose trees—the most time consuming claim to ratify in Dakota Territory—rather than farm or pasture claim, indicates a familiarity and skill with forestry that represents a continuation of his Norwegian roots. Additionally, the pride Carl expresses in the planting and growth of his trees, suggests a connection to the wooded landscape beyond a merely occupational appreciation. Carl’s memoirs, written near the end of his life after returning to Wisconsin, are interspersed with references to the pleasure he derived from the birth and growth of his children and, to slightly lesser extent, the trees he planted. Here was a pioneer literally creating a forest around his family, a man who not only adored his children, but also appeared acutely conscious of the preciousness of childhood. I could not have cast a more perfect steward of the little kubbestol, if I had written him into existence myself. Of course, the fact that Carl’s character cooperates with my romantic vision for the kubbestol’s domestic context, does not amount to proof. However, numerous accounts in the memoir of visits between Carl, his parents, Aslak, and other siblings, may support the broadening of that context. The relative frequency of these visits, and the warmth with which they are recounted, suggests a close-knit clan. And though it would be irresponsible to assert that the values and character Carl expresses through his memoirs can be applied to the Grimstad’s as a whole, the strength of the extended family bond at least suggests a harmonious kinship. Regardless of which member of the Grimstad family is responsible for the little kubbestol, its making and keeping signify a connection to their Norwegian heritage that extends beyond the inheritance of practical customs, to a purposeful engagement with a creative folk tradition that employs an imaginative interaction with the landscape. However the kubbestol form was originally conceived, it had long since ceased to be an efficient or practical seating solution. And whether or not the little kubbestol was created to accommodate a small child, or as rehearsal for an aspiring craftsman, its existence implies that the art form was valued not only as a decorative symbol of heritage, but as an expression of ethnicity worth fostering in the next generation. If we accept that the little kubbestol was made either by Knut, or by one of his children while still living at home, then its long life in the Grimstad homestead further supports its reading as a symbol of the family’s regard for their heritage. It would have been safely kept in the family home for at least fifty years by the time Aslak parted with it. The sale itself contributes to the idea that the kubbestol was a cherished household object. At the time of the sale, Aslak was an elderly man. The quote previously mentioned from Carl Grimstad’s memoirs continues, “Now only Aslak is left, he is on the old homestead yet, but is now past “three score and ten”, the biblical age allotted to men.” Carl’s somewhat dour reference to his younger brother’s age and his position as the only one left, implies that they were both facing the end of life. And it is possible that, just as Carl was writing his memoirs as a preparatory act ensuring the posterity of his legacy, so perhaps was Aslak, as the last of his generation and proprietor of the family home, preparing to ensure the preservation of part of the Grimstad heritage. My sentimental appraisal of why Aslak sold the kubbestols should be qualified by an acknowledgment of the particular moment in economic history in which the sale transpired. The June of 1929 was just a few months before the fateful “Black Tuesday” stock market crash that solidified the beginning of the greatest economic depression this country has ever endured. But as many economists acknowledge, the nation’s economic woes had begun well before the event that came to define the depression. Very few Americans were untouched by the depression, and it is possible that Aslak was motivated by an uncertain economy to take advantage of Isaac Dahle’s fascination with Norwegian folk-ethnicity in exchange for the (not inconsiderable at the time) sum of twenty-five dollars. I have still the pay coming for teaching six or eight weeks. Needless to say, I never asked them for the pay, and I am afraid it is outlawed by this time. I reasoned I could better afford to do this teaching gratis than crowd those poor settlers for pay. Now, I would like to live those days over again. I am more worried about money matters now in 1932 than I was fifty years ago, when I looked the world in the face, and had no doubts about the final outcome in the future. Carl’s lament over a fifty-year old payment is significant. In a memoir that otherwise attests to Carl’s generous and civic-minded character, his regret that he did not “crowd those poor settlers for pay” suggests the extremity of the contemporary economic climate. Even if Aslak’s kubbestol sale was fiscally motivated, the fact that it was sold to Little Norway is a testament to the regard he and other family members had for the stool. Isaac Dahle’s rabid enthusiasm for Norwegian folk art provided Aslak with a way to commit a piece of his family’s heritage, to a shrine devoted to that heritage. After all of my research, the little kubbestol is perhaps more an object of mystique now, than it was the first day I encountered it. It has been a portal, leading me to uncover some of the family history of Mount Horeb natives, as well as some of the cultural identity that infuses the lives and imaginations of Norwegians and Norwegian-Americans. But the kubbestol itself has operated much like the magical objects and creatures that populate Norwegian folk-tales; appearing without explanation to influence the actions of the characters, and direction of the plot. Though not an official title, I will from here forward use the italicized kubbestol, or little kubbestol to distinguish the particular object of this study from more general discussion of a kubbestol or kubbestols as a type. Sherry Turkle, ed., Evocative Objects: Things We Think With (Cambridge, MA: MIT Press, 2007), 5. The Norwegian work ‘kubbe’ designates a section of timber that is shorter than a log, but longer than a stump. For an in-depth discussion of “the migration of tradition” see the book by Marion J. Nelson, Norwegian Folk Art: The Migration of a Tradition (New York: Abbeville Press, 1995). Unless otherwise noted, all facts and figures regarding Norwegian geography are sourced from, Asbjørn Moen, Arvid Lillethun, and Arvid Odland, in Vegetation (Hønefoss: Norwegian Mapping Authority, 1999). Little Norway purchase logs are housed in the Mount Horeb Historical Society Archives. For further discussion of the choices immigrants faced when relocating, see Jon Gjerde, “The Immigrants Luggage: Observations Based on Written Sources,” in Norwegian Folk Art: The Migration of a Tradition, by Marion J. Nelson (New York: Abbeville Press, 1995). Boucher, Alan. Elves, Trolls and Elemental Beings: Icelandic Folktales II. Reykjavik, Iceland: Iceland Review Library, 1977. Craigie, William A. Scandinavian Folk-lore; Illustrations of the Traditional Beliefs of the Northern Peoples. Detroit: Singing Tree Press, 1970. Cranz, Galan. “A New Way of Thinking about Taste.” In The Nature of Craft and the Penland Experience, edited by Jean W. McLaughlin. New York: Lark Books, 2004. Henning, Darrell D., Marion J. Nelson, and Roger L. Welsch. Norwegian Woodcarving of the Upper MIdwest. Decorah, Iowa: Vesterheim, 1978. Hobsbawm, E. J., and T. O. Ranger. The Invention of Tradition. Cambridge: Cambridge University Press, 1983. Joranger, Terje Mikael Hasle. The Migration of Tradition. Oslo, Norway: Dept. of Archaeology, Conservation and History, Faculty of Humanities, University of Oslo, 2008. Kaivola-Bregenhøj, Annikki, Barbro Sklute. Klein, and Ulf Palmenfelt. Narrating, Doing, Experiencing: Nordic Folkloristic Perspectives. Helsinki: Finnish Literature Society, 2006. Martin, Philip. Rosemaling in the Upper Midwest: A Story of Region & Revival. Mount Horeb, WI: Wisconsin Folk Museum, 1989. Moen, Asbjørn, Arvid Lillethun, and Arvid Odland. Vegetation. Hønefoss: Norwegian Mapping Authority, 1999. Nelson, Marion J. Material Culture and People’s Art among the Norwegians in America. Northfield, MN: Norwegian-American Historical Association, 1994. Nelson, Marion J. Norwegian Folk Art: The Migration of a Tradition. New York: Abbeville Press, 1995. Noble, Allen G. To Build in a New Land: Ethnic Landscapes in North America. Baltimore: Johns Hopkins University Press, 1992. Rathbun, Mary Yeater, ed. The Historic Perry Norwegian Settlement. Daleyville, WI: Perry Historical Center, 1994. Riopelle, Christopher, and Sarah Herring. Forests, Rocks, Torrents: Norwegian and Swiss Landscapes from the Lunde Collection. London: National Gallery, 2011. Romnes, Harriet. Rosemaling: An Inspired Norwegian Folk Art. Madison, WI: H. Romnes, 1970. Simpson, Jacqueline. Scandinavian Folktales. London, England: Penguin Books, 1988. Stewart, Janice S. The Folk Arts of Norway. 2nd ed. New York: Dover, 1972. Stitt, J. Michael. Beowulf and the Bear’s Son: Epic, Saga, and Fairytale in Northern Germanic Tradition. New York: Garland Pub., 1992. Teske, Robert Thomas. Wisconsin Folk Art: A Sesquicentennial Celebration. Cedarburg, WI: Cedarburg Cultural Center, 1997. Turkle, Sherry, ed. Evocative Objects: Things We Think With. Cambridge, MA: MIT Press, 2007. Creators, Collectors & Communities by By Joanna Wilson is licensed under a Creative Commons Attribution 4.0 International License, except where otherwise noted.